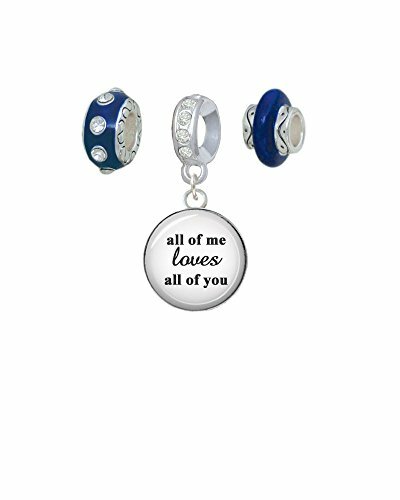 Silvertone Domed All of Me Loves All of You Navy Charm Beads (Set of 3). Silvertone Domed All of Me Loves All of You is approximately 0.9 x 0.7 x 0.2 inches (HxWxD) including loop. High quality printed paper sealed under a glass dome in a metal frame. Wonderful quote to tell someone how special they are to you. Crystal Rondelle Charm Bead is approx. 12x5x12mm (HxWxD). Hole size: 5.5mm. Large Crystal Enamel Spacer is approx. 14x8x14mm (HxWxD) - Hole Size 6.3mm. Enamel Spacer (Shown on Right) is approx. 14x9x14mm (HxWxD) - Hole Size 5mm. Our Charm Beads are compatible with most Charm Bead Bracelets. Also makes a great necklace pendant. PLEASE NOTE: Our products are lead safe, but are not intended for children 14 years and younger. Silvertone Domed All of Me Loves All of You Navy Charm Beads (Set of 3). Silvertone Domed All of Me Loves All of You is approximately 0.9 x 0.7 x 0.2 inches (HxWxD) including loop. High quality printed paper sealed under a glass dome in a metal frame. Wonderful quote to tell someone how special they are to you. Crystal Rondelle Charm Bead is approx. 12x5x12mm (HxWxD). Hole size: 5.5mm. Large Crystal Enamel Spacer is approx. 14x8x14mm (HxWxD) - Hole Size 6.3mm. Enamel Spacer (Shown on Right) is approx. 14x9x14mm (HxWxD) - Hole Size 5mm. Our Charm Beads are compatible with most Charm Bead Bracelets. Also makes a great necklace pendant. If you have any questions about this product by Delight Beads, contact us by completing and submitting the form below. If you are looking for a specif part number, please include it with your message.